GATE provides a variety of tools for automatic evaluation. The Annotation Diﬀ tool compares two annotation sets within a document. Corpus QA extends Annotation Diﬀ to an entire corpus. 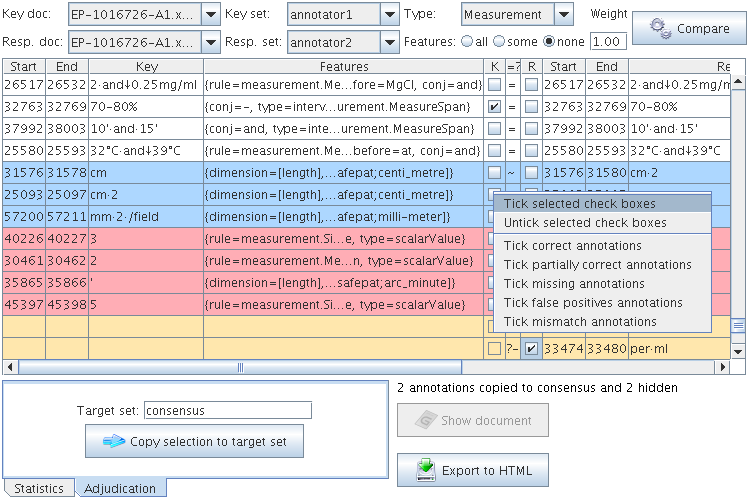 The Corpus Benchmark tool also provides functionality for comparing annotation sets over an entire corpus. Additionally, two plugins cover similar functionality; one implements inter-annotator agreement, and the other, the balanced distance metric. These tools are particularly useful not just as a ﬁnal measure of performance, but as a tool to aid system development by tracking progress and evaluating the impact of changes as they are made. Applications include evaluating the success of a machine learning or language engineering application by comparing its results to a gold standard and also comparing annotations prepared by two human annotators to each other to ensure that the annotations are reliable. This chapter begins by introducing the concepts and metrics relevant, before describing each of the tools in turn. When we evaluate the performance of a processing resource such as tokeniser, POS tagger, or a whole application, we usually have a human-authored ‘gold standard’ against which to compare our software. However, it is not always easy or obvious what this gold standard should be, as diﬀerent people may have diﬀerent opinions about what is correct. Typically, we solve this problem by using more than one human annotator, and comparing their annotations. We do this by calculating inter-annotator agreement (IAA), also known as inter-rater reliability. IAA can be used to assess how diﬃcult a task is. This is based on the argument that if two humans cannot come to agreement on some annotation, it is unlikely that a computer could ever do the same annotation ‘correctly’. Thus, IAA can be used to ﬁnd the ceiling for computer performance. There are many possible metrics for reporting IAA, such as Cohen’s Kappa, prevalence, and bias [Eugenio & Glass 04]. Kappa is the best metric for IAA when all the annotators have identical exhaustive sets of questions on which they might agree or disagree. In other words, it is a classiﬁcation task. This could be a task like ‘are these names male or female names’. However, sometimes there is disagreement about the set of questions, e.g. when the annotators themselves determine which text spans they ought to annotate, such as in named entity extraction. That could be a task like ‘read over this text and mark up all references to politics’. When annotators determine their own sets of questions, it is appropriate to use precision, recall, and F-measure to report IAA. Precision, recall and F-measure are also appropriate choices when assessing performance of an automated application against a trusted gold standard. In this section, we will ﬁrst introduce some relevant terms, before outlining Cohen’s Kappa and similar measures, in Section 10.1.2. We will then introduce precision, recall and F-measure in Section 10.1.3. Two annotations are coextensive if they hit the same span of text in a document. Basically, both their start and end oﬀsets are equal. Two annotations overlap if they share a common span of text. Two annotations are compatible if they are coextensive and if the features of one (usually the ones from the key) are included in the features of the other (usually the response). Two annotations are partially compatible if they overlap and if the features of one (usually the ones from the key) are included in the features of the other (response). This applies only to the key annotations. A key annotation is missing if either it is not coextensive or overlapping, orif one or more features are not included in the response annotation. This applies only to the response annotations. A response annotation is spurious if either it is not coextensive or overlapping, or if one or more features from the key are not included in the response annotation. The three commonly used IAA measures are observed agreement, speciﬁc agreement, and Kappa (κ) [Hripcsak & Heitjan 02]. Those measures can be calculated from a contingency table, which lists the numbers of instances of agreement and disagreement between two annotators on each category. To explain the IAA measures, a general contingency table for two categories cat1 and cat2 is shown in Table 10.1. The extension of the above formula to more than two categories is straightforward. The extension to more than two annotators is usually taken as the mean of the pair-wise agreements [Fleiss 75], which is the average agreement across all possible pairs of annotators. An alternative compares each annotator with the majority opinion of the others [Fleiss 75]. However, the observed agreement has two shortcomings. One is that a certain amount of agreement is expected by chance. The Kappa measure is a chance-corrected agreement. Another is that it sums up the agreement on all the categories, but the agreements on each category may diﬀer. Hence the category speciﬁc agreement is needed. Kappa is deﬁned as the observed agreements Ao minus the agreement expected by chance Ae and is normalized as a number between -1 and 1.
κ = 1 means perfect agreements, κ = 0 means the agreement is equal to chance, κ = −1 means ‘perfect’ disagreement. There are two diﬀerent ways of computing the chance agreement Ae (for a detailed explanations about it see [Eugenio & Glass 04]; however, a quick outline will be given below). The Cohen’s Kappa is based on the individual distribution of each annotator, while the Siegel & Castellan’s Kappa is based on the assumption that all the annotators have the same distribution. The former is more informative than the latter and has been used widely. Cohen’s Kappa requires that the expected agreement be calculated as follows. Divide marginal sums by the total to get the portion of the instances that each annotator allocates to each category. Multiply annotator’s proportions together to get the likelihood of chance agreement, then total these ﬁgures. Table 10.3 gives a worked example. The formula can easily be extended to more than two categories. Siegel & Castellan’s Kappa is applicable for any number of annotators. Siegel & Castellan’s Kappa for two annotators is also known as Scott’s Pi (see [Lombard et al. 02]). It diﬀers from Cohen’s Kappa only in how the expected agreement is calculated. Table 10.4 shows a worked example. Annotator totals are added together and divided by the number of decisions to form joint proportions. These are then squared and totalled. The Kappa suﬀers from the prevalence problem which arises because imbalanced distribution of categories in the data increases Ae. The prevalence problem can be alleviated by reporting the positive and negative speciﬁed agreement on each category besides the Kappa [Hripcsak & Heitjan 02, Eugenio & Glass 04]. In addition, the so-called bias problem aﬀects the Cohen’s Kappa, but not S&C’s. The bias problem arises as one annotator prefers one particular category more than another annotator. [Eugenio & Glass 04] advised to compute the S&C’s Kappa and the speciﬁc agreements along with the Cohen’s Kappa in order to handle these problems. Where I and J are the number of instances and annotators, respectively; Y ic is the number of annotators who assigns the category c to the instance I; pcj is the probability of the annotator j assigning category c; pc is the probability of assigning category by all annotators (i.e. averaging pcj over all annotators). The Krippendorﬀ’s alpha, another variant of Kappa, diﬀers only slightly from the S&C’s Kappa on nominal category problem (see [Carletta 96, Eugenio & Glass 04]). However, note that the Kappa (and the observed agreement) is not applicable to some tasks. Named entity annotation is one such task [Hripcsak & Rothschild 05]. In the named entity annotation task, annotators are given some text and are asked to annotate some named entities (and possibly their categories) in the text. Diﬀerent annotators may annotate diﬀerent instances of the named entity. So, if one annotator annotates one named entity in the text but another annotator does not annotate it, then that named entity is a non-entity for the latter. However, generally the non-entity in the text is not a well-deﬁned term, e.g. we don’t know how many words should be contained in the non-entity. On the other hand, if we want to compute Kappa for named entity annotation, we need the non-entities. This is why people don’t compute Kappa for the named entity task. Much of the research in IE in the last decade has been connected with the MUC competitions, and so it is unsurprising that the MUC evaluation metrics of precision, recall and F-measure [Chinchor 92] also tend to be used, along with slight variations. These metrics have a very long-standing tradition in the ﬁeld of IR [van Rijsbergen 79] (see also [Manning & Schütze 99, Frakes & Baeza-Yates 92]). Precision measures the number of correctly identiﬁed items as a percentage of the number of items identiﬁed. In other words, it measures how many of the items that the system identiﬁed were actually correct, regardless of whether it also failed to retrieve correct items. The higher the precision, the better the system is at ensuring that what is identiﬁed is correct. Error rate is the inverse of precision, and measures the number of incorrectly identiﬁed items as a percentage of the items identiﬁed. It is sometimes used as an alternative to precision. Recall measures the number of correctly identiﬁed items as a percentage of the total number of correct items. In other words, it measures how many of the items that should have been identiﬁed actually were identiﬁed, regardless of how many spurious identiﬁcations were made. The higher the recall rate, the better the system is at not missing correct items. Clearly, there must be a tradeoﬀ between precision and recall, for a system can easily be made to achieve 100% precision by identifying nothing (and so making no mistakes in what it identiﬁes), or 100% recall by identifying everything (and so not missing anything). The F-measure [van Rijsbergen 79] is often used in conjunction with Precision and Recall, as a weighted average of the two. False positives are a useful metric when dealing with a wide variety of text types, because it is not dependent on relative document richness in the same way that precision is. By this we mean the relative number of entities of each type to be found in a set of documents. When comparing diﬀerent systems on the same document set, relative document richness is unimportant, because it is equal for all systems. When comparing a single system’s performance on diﬀerent documents, however, it is much more crucial, because if a particular document type has a signiﬁcantly diﬀerent number of any type of entity, the results for that entity type can become skewed. Compare the impact on precision of one error where the total number of correct entities = 1, and one error where the total = 100. Assuming the document length is the same, then the false positive score for each text, on the other hand, should be identical. where β reﬂects the weighting of P vs. R. If β is set to 1, the two are weighted equally. With β set to 0.5, precision weights twice as much as recall. And with β set to 2, recall weights twice as much as precision. where c is some constant independent from document richness, e.g. the number of tokens or sentences in the document. Note that we consider annotations to be partially correct if the entity type is correct and the spans are overlapping but not identical. Partially correct responses are normally allocated a half weight. Where precision, recall and f-measure are calculated over a corpus, there are options in terms of how document statistics are combined. Micro averaging essentially treats the corpus as one large document. Correct, spurious and missing counts span the entire corpus, and precision, recall and f-measure are calculated accordingly. Macro averaging calculates precision, recall and f-measure on a per document basis, and then averages the results. The method of choice depends on the priorities of the case in question. Macro averaging tends to increase the importance of shorter documents. It is also possible to calculate a macro average across annotation types; that is to say, precision, recall and f-measure are calculated separately for each annotation type and the results then averaged. The Annotation Diﬀ tool enables two sets of annotations in one or two documents to be compared, in order either to compare a system-annotated text with a reference (hand-annotated) text, or to compare the output of two diﬀerent versions of the system (or two diﬀerent systems). For each annotation type, ﬁgures are generated for precision, recall, F-measure. Each of these can be calculated according to 3 diﬀerent criteria - strict, lenient and average. The reason for this is to deal with partially correct responses in diﬀerent ways. The Strict measure considers all partially correct responses as incorrect (spurious). The Lenient measure considers all partially correct responses as correct. The Average measure allocates a half weight to partially correct responses (i.e. it takes the average of strict and lenient). It can be accessed both from GATE Developer and from GATE Embedded. Annotation Diﬀ compares sets of annotations with the same type. When performing the comparison, the annotation oﬀsets and their features will be taken into consideration. and after that, the comparison process is triggered. All annotations from the key set are compared with the ones from the response set, and those found to have the same start and end oﬀsets are displayed on the same line in the table. Then, the Annotation Diﬀ evaluates if the features of each annotation from the response set subsume those features from the key set, as speciﬁed by the features names you provide. To use the annotation diﬀ tool, see Section 10.2.1. To create a gold standard, see section 10.2.2. To compare more than two annotation sets, see Section 3.4.3. Figure 10.1: Annotation diﬀ window with the parameters at the top, the comparison table in the center and the statistics panel at the bottom. The Annotation Diﬀ tool is activated by selecting it from the Tools menu at the top of the GATE Developer window. It will appear in a new window. Select the key and response documents to be used (note that both must have been previously loaded into the system), the annotation sets to be used for each, and the annotation type to be compared. Note that the tool automatically intersects all the annotation types from the selected key annotation set with all types from the response set. On a separate note, you can perform a diﬀ on the same document, between two diﬀerent annotation sets. One annotation set could contain the key type and another could contain the response one. After the type has been selected, the user is required to decide how the features will be compared. It is important to know that the tool compares them by analysing if features from the key set are contained in the response set. It checks for both the feature name and feature value to be the same. To take ‘none’ of the features from the key set. The weight for the F-Measure can also be changed - by default it is set to 1.0 (i.e. to give precision and recall equal weight). Finally, click on ‘Compare’ to display the results. Note that the window may need to be resized manually, by dragging the window edges as appropriate). In the main window, the key and response annotations will be displayed. They can be sorted by any category by clicking on the central column header: ‘=?’. The key and response annotations will be aligned if their indices are identical, and are color coded according to the legend displayed at the bottom. Precision, recall, F-measure are also displayed below the annotation tables, each according to 3 criteria - strict, lenient and average. See Sections 10.2 and 10.1 for more details about the evaluation metrics. The results can be saves to an HTML ﬁle by using the ‘Export to HTML’ button. This creates an HTML snapshot of what the Annotation Diﬀ table shows at that moment. The columns and rows in the table will be shown in the same order, and the hidden columns will not appear in the HTML ﬁle. The colours will also be the same. If you need more details or context you can use the button ‘Show document’ to display the document and the annotations selected in the annotation diﬀ drop down lists and table. Figure 10.2: Annotation diﬀ window with the parameters at the top, the comparison table in the center and the adjudication panel at the bottom. In order to create a gold standard set from two sets you need to show the ‘Adjudication’ panel at the bottom. It will insert two checkboxes columns in the central table. Tick boxes in the columns ‘K(ey)’ and ‘R(esponse)’ then input a Target set in the text ﬁeld and use the ‘Copy selection to target’ button to copy all annotations selected to the target annotation set. There is a context menu for the checkboxes to tick them quickly. Each time you will copy the selection to the target set to create the gold standard set, the rows will be hidden in further comparisons. In this way, you will see only the annotations that haven’t been processed. At the end of the gold standard creation you should have an empty table. To see again the copied rows, select the ‘Statistics’ tab at the bottom and use the button ‘Compare’. A bottom tab in each corpus view is entitled ‘Corpus Quality Assurance’. This tab will allow you to calculate precision, recall and F-score between two annotation sets in a corpus without the need to load a plugin. It extends the Annotation Diﬀ functionality to the entire corpus in a convenient interface. The main part of the view consists of two tabs each containing a table. One tab is entitled ‘Corpus statistics’ and the other is entitled ‘Document statistics’. To the right of the tabbed area is a conﬁguration pane in which you can select the annotation sets you wish to compare, the annotation types you are interested in and the annotation features you wish to specify for use in the calculation if any. At the top, several icons are for opening a document (double-clicking on a row is also working) or Annotation Diﬀ only when a row in the document statistics table is selected, exporting the tables to an HTML ﬁle, reloading the list of sets, types and features when some documents have been modiﬁed in the corpus and getting this help page. Corpus Quality Assurance works also with a corpus inside a datastore. Using a datastore is useful to minimise memory consumption when you have a big corpus. See the section 10.1 for more details about the evaluation metrics. Begin by selecting the annotation sets you wish to compare in the top list in the conﬁguration pane. Clicking on an annotation set labels it annotation set A for the Key (an ‘(A)’ will appear beside it to indicate that this is your selection for annotation set A). Now click on another annotation set. This will be labelled annotation set B for the response. To change your selection, deselect an annotation set by clicking on it a second time. You can now choose another annotation set. Note that you do not need to hold the control key down to select the second annotation set. This list is conﬁgured to accept two (and no more than two) selections. If you wish, you may check the box ‘present in every document’ to reduce the annotation sets list to only those sets present in every document. You may now choose the annotation types you are interested in. If you don’t choose any then all will be used. If you wish, you may check the box ‘present in every selected set’ to reduce the annotation types list to only those present in every selected annotation set. You can choose the annotation features you wish to include in the calculation. If you choose features, then for an annotation to be considered a match to another, their feature values must also match. If you select the box ‘present in every selected type’ the features list will be reduced to only those present in every type you selected. For the classiﬁcation measures you must select only one type and one feature. The ‘Measures’ list allows you to choose whether to calculate strict or lenient ﬁgures or average the two. You may choose as many as you wish, and they will be included as columns in the table to the left. The BDM measures allow to accept a match when the two concept are close enough in an ontology even if their name are diﬀerent. See section 10.6. An ‘Options’ button above the ‘Measures’ list gives let you set some settings like the beta for the Fscore or the BDM ﬁle. Finally, click on the ‘Compare’ button to recalculate the tables. The ﬁgures that appear in the several tables (one per tab) are described below. In this table you will see that one row appears for every annotation type you chose. Columns give total counts for matching annotations (‘Match’ equivalent to TREC Correct), annotations only present in annotation set A/Key (‘Only A’ equivalent to TREC Missing), annotations only present in annotation set B/Response (‘Only B’ equivalent to TREC Spurious) and annotations that overlapped (‘Overlap’ equivalent to TREC Partial). Depending on whether one of your annotation sets is considered a gold standard, you might prefer to think of ‘Only A’ as missing and ‘Only B’ as spurious, or vice versa, but the Corpus Quality Assurance tool makes no assumptions about which if any annotation set is the gold standard. Where it is being used to calculate Inter Annotator Agreement there is no concept of a ‘correct’ set. However, in ‘MUC’ terms, ‘Match’ would be correct and ‘Overlap’ would be partial. After these columns, three columns appear for every measure you chose to calculate. If you chose to calculate a strict F1, a recall, precision and F1 column will appear for the strict counts. If you chose to calculate a lenient F1, precision, recall and F1 columns will also appear for lenient counts. In the corpus statistics table, calculations are done on a per type basis and include all documents in the calculation. Final rows in the table provide summaries; total counts are given along with a micro and a macro average. Micro averaging treats the entire corpus as one big document where macro averaging, on this table, is the arithmetic mean of the per-type ﬁgures. See Section 10.1.4 for more detail on the distinction between a micro and a macro average. In this table you will see that one row appears for every document in the corpus. Columns give counts as in the corpus statistics table, but this time on a per-document basis. As before, for every measure you choose to calculate, precision, recall and F1 columns will appear in the table. Summary rows, again, give a macro average (arithmetic mean of the per-document measures) and micro average (identical to the ﬁgure in the corpus statistics table). You can get the same results as the Corpus Quality Assurance tool from your program by using the classes that compute the results. They are three for the moment: AnnotationDiﬀer, ClassiﬁcationMeasures and OntologyMeasures. All in gate.util package. To compute the measures respect the order below. With bdmFileUrl an URL to a ﬁle of the format described at section 10.6. With verbose to be set to true if you want to get printed the annotations ignored on the "standard" output stream. Note that the numeric value ‘1.0’ represents the beta coeﬃcient in the Fscore. See section 10.1 for more information on these measures. The following example is taken from gate.gui.CorpusQualityAssurance#compareAnnotation but hasn’t been ran so there could be some corrections to make. See method gate.gui.CorpusQualityAssurance#printSummary for micro and macro average like in the Corpus Quality Assurance. We have also implemented a processing resource called Quality Assurance PR that wraps the functionality of the QA Tool. At the time of writing this documentation, the only diﬀerence the QA PR has in terms of functionality is that the PR only accepts one measure at a time. The Quality Assuarance PR is included in the Tools plugin. The PR can be added to any existing corpus pipeline. Since the QA tool works on the entire corpus, the PR has to be executed after all the documents in the corpus have been processed. In order to achieve this, we have designed the PR in such a way that it only gets executed when the pipeline reaches to the last document in the corpus. There are no init-time parameters but users are required to provide values for the following run-time parameters. annotationTypes - annotation types to compare. featuresNames - features of the annotation types (speciﬁed above) to compare. keyASName - the annotation set that acts as a gold standard set and contains annotations of the types speciﬁed above in the ﬁrst parameter. responseASName - the annotation set that acts as a test set and contains annotations of the types speciﬁed above in the ﬁrst parameter. measure - one of the six pre-deﬁned measures: F1_STRICT, F1_AVERAGE, F1_LENIENT, F05_STRICT, F05_AVERAGE and F05_LENIENT. outputFolderUrl - the PR produces two html ﬁles in the folder mentioned in this parameter. The ﬁles are document-stats.html and the corpus-stats.html. The former lists statistics for each document and the latter lists statistics for each annotation type in the corpus. In case of the document-stats.html, each document is linked with an html ﬁle that contains the output of the annotation diﬀ utility in GATE. Like the Corpus Quality Assurance functionality, the corpus benchmark tool enables evaluation to be carried out over a whole corpus rather than a single document. Unlike Corpus QA, it uses matched corpora to achieve this, rather than comparing annotation sets within a corpus. It enables tracking of the system’s performance over time. It provides more detailed information regarding the annotations that diﬀer between versions of the corpus (e.g. annotations created by diﬀerent versions of an application) than the Corpus QA tool does. The basic idea with the tool is to evaluate an application with respect to a ‘gold standard’. You have a ‘marked’ corpus containing the gold standard reference annotations; you have a ‘clean’ copy of the corpus that does not contain the annotations in question, and you have an application that creates the annotations in question. Now you can see how you are getting on, by comparing the result of running your application on ‘clean’ to the ‘marked’ annotations. main: you should have a main directory containing subdirectories for your matched corpora. It does not matter what this directory is called. This is the directory you will select when the program prompts, ‘Please select a directory which contains the documents to be evaluated’. clean: Make a directory called ‘clean’ (case-sensitive), and in it, make a copy of your corpus that does not contain the annotations that your application creates (though it may contain other annotations). The corpus benchmark tool will apply your application to this corpus, so it is important that the annotations it creates are not already present in the corpus. You can create this corpus by copying your ‘marked’ corpus and deleting the annotations in question from it. marked: you should have a ‘gold standard’ copy of your corpus in a directory called ‘marked’ (case-sensitive), containing the annotations to which the program will compare those produced by your application. The idea of the corpus benchmark tool is to tell you how good your application performance is relative to this annotation set. The ‘marked’ corpus should contain exactly the same documents as the ‘clean’ set. The properties of the corpus benchmark tool are deﬁned in the ﬁle ‘corpus_tool.properties’, which should be located in the GATE home directory. GATE will tell you where it’s looking for the properties ﬁle in the ‘message’ panel when you run the Corpus Benchmark Tool. It is important to prepare this ﬁle before attempting to run the tool because there is no ﬁle present by default, so unless you prepare this ﬁle, the corpus benchmark tool will not work! the feature values to be considered, if any (annotFeatures). The default annotation set has to be represented by an empty string. The outputSetName and annotSetName must be diﬀerent, and cannot both be the default annotation set. (If they are the same, then use the Annotation Set Transfer PR to change one of them.) If you omit any line (or just leave the value blank), that property reverts to default. For example, ‘annotSetName=’ is the same as leaving that line out. We will describe these options in a diﬀerent order to that in which they appear on the menu, to facilitate explanation. Store Corpus for Future Evaluation populates the ‘processed’ directory with a datastore containing the result of running your application on the ‘clean’ corpus. If a ‘processed’ directory exists, the results will be placed there; if not, one will be created. This creates a record of the current application performance. You can rerun this operation any time to update the stored set. Human Marked Against Stored Processing Results compares the stored ‘processed’ set with the ‘marked’ set. This mode assumes you have already run ‘Store corpus for future evaluation’. It performs a diﬀ between the ‘marked’ directory and the ‘processed’ directory and prints out the metrics. Human Marked Against Current Processing Results compares the ‘marked’ set with the result of running the application on the ‘clean’ corpus. It runs your application on the documents in the ‘clean’ directory creating a temporary annotated corpus and performs a diﬀ with the documents in the ‘marked’ directory. After the metrics (recall, precision, etc.) are calculated and printed out, it deletes the temporary corpus. Default Mode runs ‘Human Marked Against Current Processing Results’ and ‘Human Marked Against Stored Processing Results’ and compares the results of the two, showing you where things have changed between versions. This is one of the main purposes of the benchmark tool; to show the diﬀerence in performance between diﬀerent versions of your application. Once the mode has been selected, the program prompts, ‘Please select a directory which contains the documents to be evaluated’. Choose the main directory containing your corpus directories. (Do not select ‘clean’, ‘marked’, or ‘processed’.) Then (except in ‘Human marked against stored processing results’ mode) you will be prompted to select the ﬁle containing your application (e.g. an .xgapp ﬁle). The tool can be used either in verbose or non-verbose mode, by selecting or unselecting the verbose option from the menu. In verbose mode, for any precision/recall ﬁgure below the user’s pre-deﬁned threshold (stored in corpus_tool.properties ﬁle) the tool will show the the non-coextensive annotations (and their corresponding text) for that entity type, thereby enabling the user to see where problems are occurring. Running the tool (either in ‘Human marked against stored processing results’, ‘Human marked against current processing results’ or ‘Default’ mode) produces an HTML ﬁle, in tabular form, which is output in the main GATE Developer messages window. This can then be pasted into a text editor and viewed in a web browser for easier viewing. See ﬁgure 10.4 for an example. Overall average ﬁgures: precision, recall and F1 calculated as a macro-average (arithmetic average) of the individual document precisions and recalls. In ‘Default’ mode, information is also provided about whether the ﬁgures have increased or decreased in comparison with the ‘Marked’ corpus. The interannotator agreement plugin, ‘Inter_Annotator_Agreement’, computes the F-measures, namely precision, recall and F1, suitable for named entity annotations (see Section 10.1.3), and agreement, Cohen’s kappa and Scott’s pi, suitable for text classiﬁcation tasks (see Section 10.1.2). In the latter case, a confusion matrix is also provided. In this section we describe those measures and the output results from the plugin. But ﬁrst we explain how to load the plugin, and the input to and the parameters of the plugin. First you need to load the plugin named ‘Inter_Annotator_Agreement’ into GATE Developer using the tool Manage CREOLE Plugins, if it is not already loaded. Then you can create a PR for the plugin from the ‘IAA Computation’ in the existing PR list. After that you can put the PR into a Corpus Pipeline to use it. The IAA Computation PR diﬀers from the Corpus Benchmark Tool in the data preparation required. 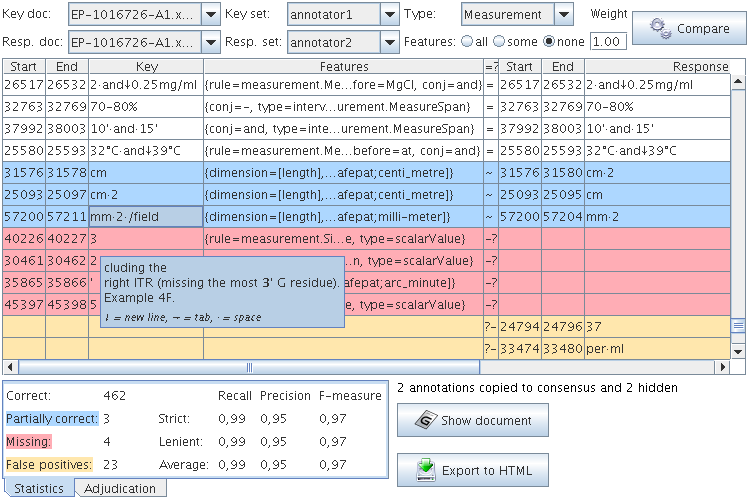 As in the Corpus Benchmark Tool, the idea is to compare annotation sets, for example, prepared by diﬀerent annotators, but in the IAA Computation PR, these annotation sets should be on the same set of documents. Thus, one corpus is loaded into GATE on which the PR is run. Diﬀerent annotation sets contain the annotations which will be compared. These should (obviously) have diﬀerent names. It falls to the user to decide whether to use annotation type or an annotation feature as class; are two annotations considered to be in agreement because they have the same type and the same span? Or do you want to mark up your data with an annotation type such as ‘Mention’, thus deﬁning the relevant annotations, then give it a ‘class’ feature, the value of which should be matched in order that they are considered to agree? This is a matter of convenience. For example, data for machine learning (see Section 19.1) uses a single annotation type and a class feature. In other contexts, using annotation type might feel more natural; the annotation sets should agree about what is a ‘Person’, what is a ‘Date’ etc. It is also possible to mix the two, as you will see below. The IAA plugin has two runtime parameters annSetsForIaa and annTypesAndFeats for specifying the annotation sets and the annotation types and features, respectively. Values should be separated by semicolons. For example, to specify annotation sets ‘Ann1’, ‘Ann2’ and ‘Ann3’ you should set the value of annSetsForIaa to ‘Ann1;Ann2;Ann3’. Note that more than two annotation sets are possible. Specify the value of annTypesAndFeats as ‘Per’ to compute the IAA for the three annotation sets on the annotation type Per. You can also specify more than one annotation type and separate them by ‘;’ too, and optionally specify an annotation feature for a type by attaching a ‘->’ followed by feature name to the end of the annotation name. For example, ‘Per->label;Org’ speciﬁes two annotation types Per and Org and also a feature name label for the type Per. If you specify an annotation feature for an annotation type, then two annotations of the same type will be regarded as being diﬀerent if they have diﬀerent values of that feature, even if the two annotations occupy exactly the same position in the document. On the other hand, if you do not specify any annotation feature for an annotation type, then the two annotations of the type will be regarded as the same if they occupy the same position in the document. The parameter measureType speciﬁes the type of measure computed. There are two measure types; the F-measure (i.e. Precision, Recall and F1), and the observed agreement and Cohen’s Kappa. For classiﬁcation tasks such as document or sentence classiﬁcation, the observed agreement and Cohen’s Kappa is often used, though the F-measure is applicable too. In these tasks, the targets are already identiﬁed, and the task is merely to classify them correctly. However, for the named entity recognition task, only the F-measure is applicable. In such tasks, ﬁnding the ‘named entities’ (text to be annotated) is as much a part of the task as correctly labelling it. Observed agreement and Cohen’s kappa are not suitable in this case. See Section 10.1.2 for further discussion. The parameter has two values, FMEASURE and AGREEMENTANDKAPPA. The default value of the parameter is FMEASURE. Another parameter verbosity speciﬁes the verbosity level of the plugin’s output. Level 2 displays the most detailed output, including the IAA measures on each document and the macro-averaged results over all documents. Level 1 only displays the IAA measures averaged over all documents. Level 0 does not have any output. The default value of the parameter is 1. In the following we will explain the outputs in detail. Yet another runtime parameter bdmScoreFile speciﬁes the URL for a ﬁle containing the BDM scores used for the BDM based IAA computation. The BDM score ﬁle should be produced by the BDM computation plugin, which is described in Section 10.6. The BDM-based IAA computation will be explained below. If the parameter is not assigned any value, or is assigned a ﬁle which is not a BDM score ﬁle, the PR will not compute the BDM based IAA. IAA has been used mainly in classiﬁcation tasks, where two or more annotators are given a set of instances and are asked to classify those instances into some pre-deﬁned categories. IAA measures the agreements among the annotators on the class labels assigned to the instances by the annotators. Text classiﬁcation tasks include document classiﬁcation, sentence classiﬁcation (e.g. opinionated sentence recognition), and token classiﬁcation (e.g. POS tagging). The important point to note is that the evaluation set and gold standard set have exactly the same instances, but some instances in the two sets have diﬀerent class labels. Identifying the instances is not part of the problem. The three commonly used IAA measures are observed agreement, speciﬁc agreement, and Kappa (κ) [Hripcsak & Heitjan 02]. See Section 10.1.2 for the detailed explanations of those measures. If you select the value of the runtime parameter measureType as AGREEMENTANDKAPPA, the IAA plugin will compute and display those IAA measures for your classiﬁcation task. Below, we will explain the output of the PR for the agreement and Kappa measures. At the verbosity level 2, the output of the plugin is the most detailed. 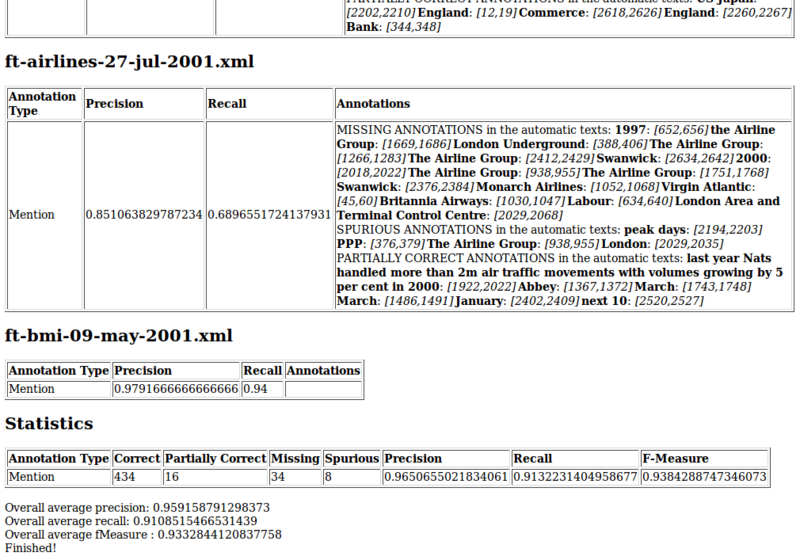 It ﬁrst prints out a list of the names of the annotation sets used for IAA computation. In the rest of the results, the ﬁrst annotation set is denoted as annotator 0, and the second annotation set is denoted as annotator 1, etc. Then the plugin outputs the IAA results for each document in the corpus. For each document, it displays one annotation type and optionally an annotation feature if speciﬁed, and then the results for that type and that feature. Note that the IAA computations are based on the pairwise comparison of annotators. In other words, we compute the IAA for each pair of annotators. The ﬁrst results for one document and one annotation type are the macro-averaged ones over all pairs of annotators, which have three numbers for the three types of IAA measures, namely Observed agreement, Cohen’s kappa and Scott’s pi. Then for each pair of annotators, it outputs the three types of measures, a confusion matrix (or contingency table), and the speciﬁc agreements for each label. The labels are obtained from the annotations of that particular type. For each annotation type, if a feature is speciﬁed, then the labels are the values of that feature. Please note that two terms may be added to the label list: one is the empty one obtained from those annotations which have the annotation feature but do not have a value for the feature; the other is ‘Non-cat’, corresponding to those annotations not having the feature at all. If no feature is speciﬁed, then two labels are used: ‘Anns’ corresponding to the annotations of that type, and ‘Non-cat’ corresponding to those annotations which are annotated by one annotator but are not annotated by another annotator. After displaying the results for each document, the plugin prints out the macro-averaged results over all documents. First, for each annotation type, it prints out the results for each pair of annotators, and the macro-averaged results over all pairs of annotators. Finally it prints out the macro-averaged results over all pairs of annotators, all types and all documents. Please note that the classiﬁcation problem can be evaluated using the F-measure too. If you want to evaluate a classiﬁcation problem using the F-measure, you just need to set the run time parameter measureType to FMEASURE. The commonly used IAA measures, such as kappa, have not been used in text mark-up tasks such as named entity recognition and information extraction, for reasons explained in Section 10.1.2 (also see [Hripcsak & Rothschild 05]). Instead, the F-measures, such as Precision, Recall, and F1, have been widely used in information extraction evaluations such as MUC, ACE and TERN for measuring IAA. This is because the computation of the F-measures does not need to know the number of non-entity examples. Another reason is that F-measures are commonly used for evaluating information extraction systems. Hence IAA F-measures can be directly compared with results from other systems published in the literature. For computing F-measure between two annotation sets, one can use one annotation set as gold standard and another set as system’s output and compute the F-measures such as Precision, Recall and F1. One can switch the roles of the two annotation sets. The Precision and Recall in the former case become Recall and Precision in the latter, respectively. But the F1 remains the same in both cases. For more than two annotators, we ﬁrst compute F-measures between any two annotators and use the mean of the pair-wise F-measures as an overall measure. The computation of the F-measures (e.g. Precision, Recall and F1) are shown in Section 10.1. As noted in [Hripcsak & Rothschild 05], the F1 computed for two annotators for one speciﬁc category is equivalent to the positive speciﬁc agreement of the category. The outputs of the IAA plugins for named entity annotation are similar to those for classiﬁcation. But the outputs are the F-measures, such as Precision, Recall and F1, instead of the agreements and Kappas. It ﬁrst prints out the results for each document. For one document, it prints out the results for each annotation type, macro-averaged over all pairs of annotators, then the results for each pair of annotators. In the last part, the micro-averaged results over all documents are displayed. Note that the results are reported in both the strict measure and the lenient measure, as deﬁned in Section 10.2. 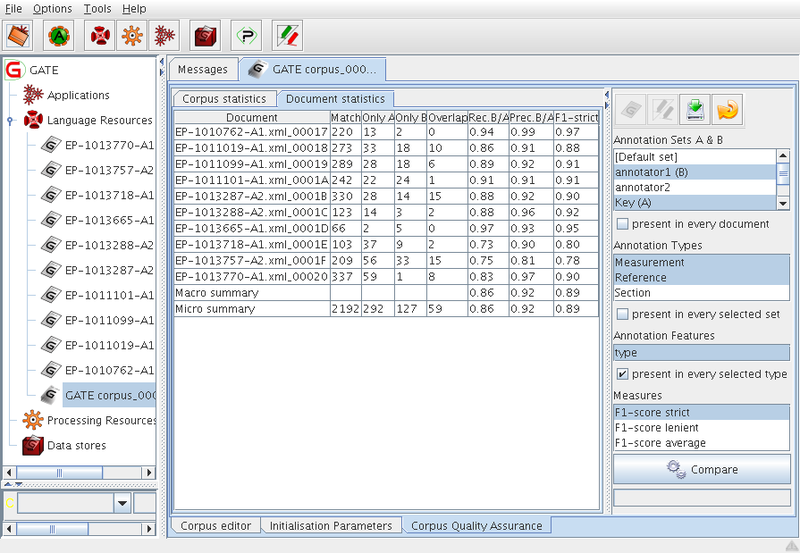 Please note that, for computing the F-measures for the named entity annotations, the IAA plugin carries out the same computation as the Corpus Benchmark tool. The IAA plugin is simpler than the Corpus benchmark tool in the sense that the former needs only one set of documents with two or more annotation sets, whereas the latter needs three sets of the same documents, one without any annotation, another with one annotation set, and the third one with another annotation set. Additionally, the IAA plugin can deal with more than two annotation sets but the Corpus benchmark tool can only deal with two annotation sets. For a named entity recognition system, if the named entity’s class labels are the names of concepts in some ontology (e.g. in the ontology-based information extraction), the system can be evaluated using the IAA measures based on the BDM scores. The BDM measures the closeness of two concepts in an ontology. If an entity is identiﬁed but is assigned a label which is close to but not the same as the true label, the system should obtain some credit for it, which the BDM-based metric can do. In contrast, the conventional named entity recognition measure does not take into account the closeness of two labels and does not give any credit to one identiﬁed entity with a wrong label, regardless of how close the assigned label is to the true label. For more explanation about BDM see Section 10.6. In order to compute the BDM-based IAA, one has to assign the plugin’s runtime parameter bdmScoreFile to the URL of a ﬁle containing the BDM scores. The ﬁle should be obtained by using the BDM computation plugin, which is described in Section 10.6. Currently the BDM-based IAA is only used for computing the F-measures for e.g. the entity recognition problem. Please note that the F-measures can also be used for evaluation of classiﬁcation problem. The BDM is not used for computing other measures such as the observed agreement and Kappa, though it is possible to implement it. Therefore currently one has to select FMEASURE for the run time parameter measureType in order to use the BDM based IAA computation. The BDM (balanced distance metric) measures the closeness of two concepts in an ontology or taxonomy [Maynard 05, Maynard et al. 06]. It is a real number between 0 and 1. The closer the two concepts are in an ontology, the greater their BDM score is. For detailed explanation about the BDM, see the papers [Maynard 05, Maynard et al. 06]. The BDM can be seen as an improved version of the learning accuracy [Cimiano et al. 03]. It is dependent on the length of the shortest path connecting the two concepts and also the deepness of the two concepts in ontology. It is also normalised with the size of ontology and also takes into account the concept density of the area containing the two involved concepts. The BDM has been used to evaluate the ontology based information extraction (qOBIE) system [Maynard et al. 06]. The OBIE identiﬁes the instances for the concepts of an ontology. It’s possible that an OBIE system identiﬁes an instance successfully but does not assign it the correct concept. Instead it assigns the instance a concept being close to the correct one. For example, the entity ‘London’ is an instance of the concept Capital, and an OBIE system assigns it the concept City which is close to the concept Capital in some ontology. In that case the OBIE should obtain some credit according to the closeness of the two concepts. That is where the BDM can be used. The BDM has also been used to evaluate the hierarchical classiﬁcation system [Li et al. 07b]. It can also be used for ontology learning and alignment. The BDM computation plugin (“Ontology: BDM computation” in the plugin manager) computes the BDM score for each pair of concepts in an ontology. Loading the plugin adds a “Calculate BDM scores” option to the right-click menu of every ontology LR. To run the calculation, right click on the relevant ontology LR, select this option, and choose a text ﬁle into which the results should be saved. It ﬁrst shows the names of the two concepts (one as key and another as response, and the BDM score, and then other parameters’ values used for the computation. Note that, since the BDM is symmetric for the two concepts, the resulting ﬁle contains only one line for each pair. So if you want to look for the BDM score for one pair of concepts, you can choose one as key and another as response. If you cannot ﬁnd the line for the pair, you have to change the order of two concepts and retrieve the ﬁle again. A BDM score ﬁle generated by this tool can be used as input to the BDM-based inter-annotator agreement calculation as described in section 10.5.3. When documents are annotated using Teamware, anonymous annotation sets are created for the annotating annotators. This makes it impossible to run Quality Assurance on such documents as annotation sets with same names in diﬀerent documents may refer to the annoations created by diﬀerent annotators. This is specially the case when a requirement is to compute Inter Annotator Agreement (IAA). The QA Summariser for Teamware PR generates a summary of agreements among annotators. It does this by pairing individual annotators involved in the annotation task. It also compares annotations of each individual annotator with those available in the consensus annotation set in the respective documents. annotationTypes Annotation types for which the IAA has to be computed. featureNames Features of annotations that should be used in IAA computations. If no value is provided, only annotation boundaries for same annotation types are compared. measure one of the six pre-deﬁned measures: F1_STRICT, F1_AVERAGE, F1_LENIENT, F05_STRICT, F05_AVERAGE and F05_LENIENT. outputFolderUrl The PR produces a summary in this folder. More information on the generated ﬁle is provided below. The PR generates an index.html ﬁle in the output folder. This html ﬁle contains a table that summarises the agreement statistics. Both the ﬁrst row and the ﬁrst column contain names of annotators who were involved in the annotation task. For each pair of annotators who did the annotations together on atleast one document, both the micro and macro averages are produced. Last two columns in each row give average macro and micro agreements of the respective annotator with all the other annotators he or she did annotations together. These ﬁgures are color coded. The color green is used for a cell background to indicate full agreement (i.e. 1.0). The background color becomes lighter as the agreement reduces towards 0.5. At 0.5 agreement, the background color of a cell is fully white. From 0.5 downwards, the color red is used and as the agreement reduces further, the color becomes darker with dark red at 0.0 agreement. Use of such a color coding makes it easy for user to get an idea of how annotators are performing and locate speciﬁc pairs of annotations who need more training or may be someone who deserves a pat on his/her back. For each pair of annotators, the summary table provides a link (with caption document) to another html document that summarises annotations of the two respective annotators on per document basis. The details include number of annotations they agreed and disagreed and the scores for recall, precision and f-measure. Each document name in this summary is linked with another html document with indepth comparison of annotations. User can actually see the annotations on which the annotators had agreed and disagreed.